Recently I stumbled across a new offering from Tamiya, the GF-01 chassis. This is similar to the old lunch box 2wd chassis in size and wheelbase. However it has the gear diffs and shadt drive from the TT series and the suspension is off the M series. So 4wd, which is great for braking and overall driving. 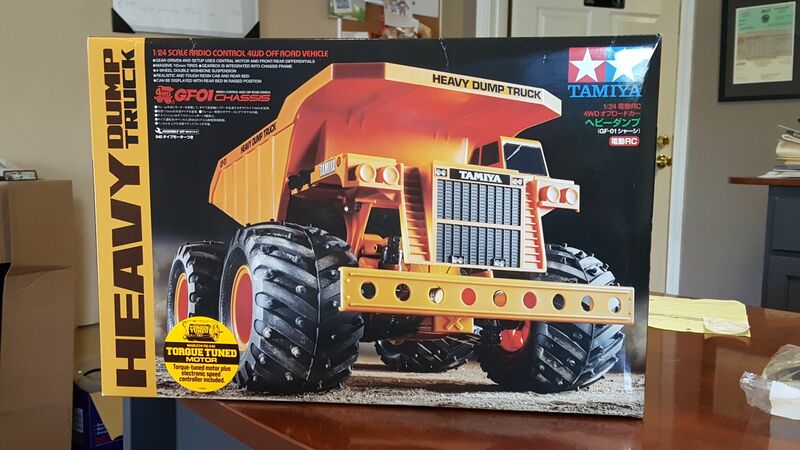 There are a few body options, but the Heavy Dump Truck really caught my eye. It reminds me of the old toy dump trucks, that were slightly cartoonish with the big tires and short wheelbase. Picked one up and put it together, easy to build. With the included brushed/brushless esc and torque tuned brushed motor the truck is quite fun to drive. I have since upgraded it with a 13.5t sensored brushless motor off ebay. 26 bucks shipped, US seller. Came with the sensor cable, but did require motor wires and bullets to be soldered on. Also bought the matching 17.5t motor, which I tried out as well. The 17.5t was about the same overall speed as the torque tuned motor, with slightly more torque. The 13.5t adds about 5-6mph to the top speed, greatly improving the bash factor. The tamiya esc is reasonably easy to program, and the startup is very good, as it should be, being sensored. The drag brake and brake intensity settings are a welcome addition. Only downside is the lack of a lipo cutoff. I can drive without one, but I am quite gangster like that. Considering it was free with a 119 dollar kit I can't complain. I am using a gens ace 5000mah 50c hardcase 2s lipo, which fits perfectly in the flat bottomed battery tray (thats right!, tray is not shaped to fit only a stick pack, woohoo). And now for the konghead!!! I was so excited seeing this, as I have a soft spot for 6x6 rc vehicles. I had to mod other parts in the past to make my own 6x6, which was fun, but it is nice to see a box stock option out there!!! The Konghead is on the g6-01 chassis, with is basically a stretched variant of the GF-01 chassis, with a rear diff and transfer gears added. It has the option of running rear wheel steering, which I did on my build. You do need to run 2 servos, but they will function correctly with a simple servo Y harness off the steering channel. It could be put on the 3rd channel and mixed if you have a radio with that function. It is an awesome kit, lots of fun to build and run. Great turning circle with the rear wheel steering. I put a torque tuned motor in that I had laying around, kit comes with a std silver can. 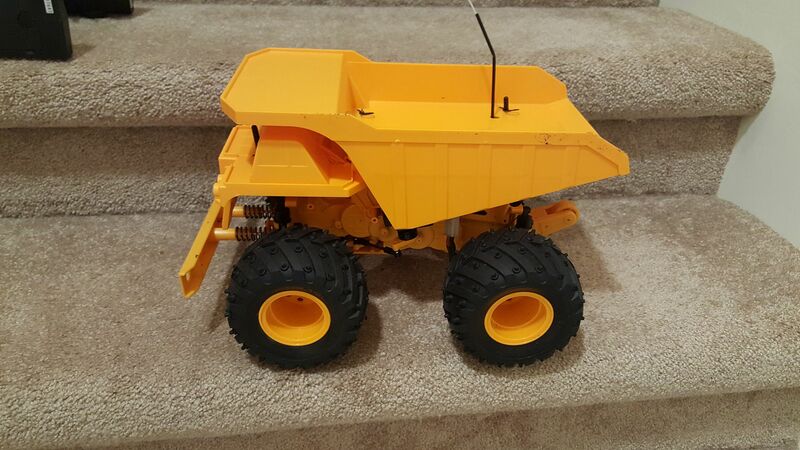 No esc included, I am using the TBLE-02s, and plan to run the 17.5t brushless motor I tried in the dump truck. It will not be as fast but will be fun to run in my yard. I also plan to lock the center and possibly the rear diff to increase crawling capability. Need some stickers on that dump truck! Is it not the TBLE-02s esc in the dump? if so, it should have a LVC to set. Yes, the body does need to be finished. I have to paint the konghead, and 5 other tamiya bodies... I have 3 of them trimmed. I plan to paint with real car paint, since I have a bunch of that at work! As long as you trim it and put the window masks on... Is it more than one color, I see some of them need the grille areas painted black 1st, then do the main body color. I could be done with some hinges, scrap plastic and a servo.